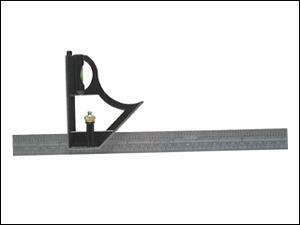 Standard multi-purpose square for use as outside and inside try square, mitre square, depth and marking gauge, steel rule, straight edge,spirit level giving horizontal 45 degree and plumb readings. The stock is a matt black rustless die-casting and is fitted with a scriber. It is fully adjustable and lockable. Size 12in/300mm Stainless steel blade.